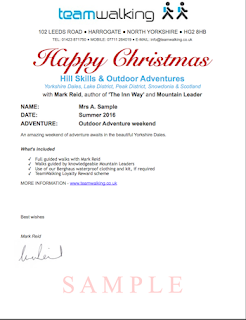 Want to head to the hills this January? Beat those January Blues with our 'Winter Dales Escape' walking weekend based at Askrigg in beautiful Wensleydale. 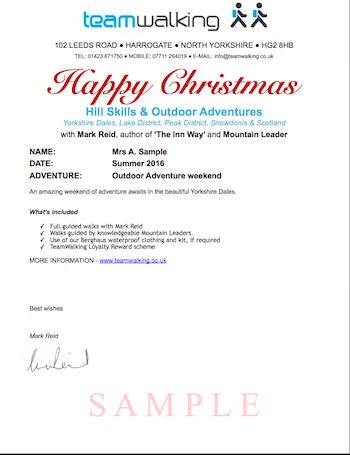 Looking for a bit of adventure? Join us for our Winter Backpacking weekend in the Lake District, walking from Coniston to Great Langdale, and back! Does your loved one love the Great Outdoors? 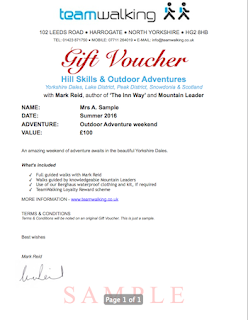 Give the gift of the hills this Christmas with TeamWalking! 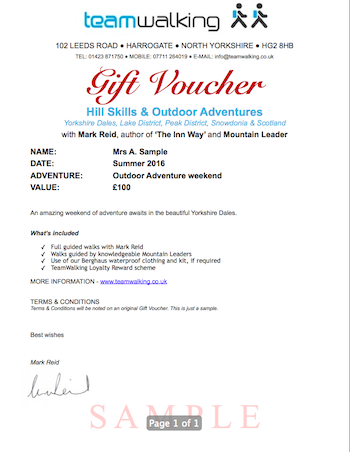 Choose either an 'open' Gift Voucher that can be redeemed against any outdoor course or adventure during 2016, or choose a specific course or walk and have a dedicated 'Happy Christmas' Voucher to give on Christmas Day! Just simply write a note in the comments box when placing your order with details of what you would like, or get in touch with us. Sunday's navigation training day as part of a 3-day NNAS 'Straight to Silver' navigation skills course, based at Sedbergh. Our route: Winder, Crook, Arant Haw and the western ridge (Nab) back down to Sedbergh.